No, no, stop. 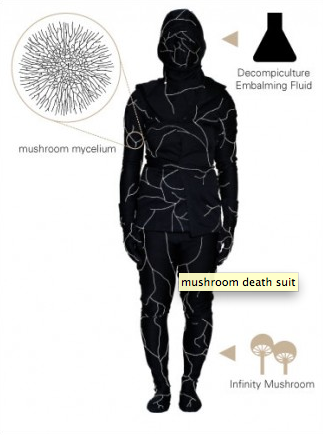 You had us at "Mushroom Death Suit." Most people don't realize that when they die, there aren't too many socially acceptable methods for disposing of a corpse (feeding a body into a wood chipper apparently doesn't go over too well). When a body isn't cremated, it's commonly injected with a lot of formaldehyde, a dangerous chemical that eventually leaches out into the ground after a burial. However, an artist has come up with a much more environmentally-friendly way of disposing bodies via The Infinity Burial Suit (though it also goes by the much sexier name, the "Mushroom Death Suit"). Artist Jae Rhim Lee has apparently been working on this suit since 2009. The suit uses ordinary shitake and oyster mushrooms to consume a body and break it down. Lee has been training the mushrooms to eat people by having them consume her skin, hair, and nails. After a while, she'll "pick the best mushrooms to become 'Infinity Mushrooms.' These Infinity Mushrooms will recognize and eat her body when she dies." On a side note, I'm pretty sure I've seen a few movies that start this way and end with the fungus wiping out humanity. At the moment, Lee's prototype of the suit has been embroidered with "mushroom-spore-infused thread." Additionally, the embroidery pattern is designed to resemble the way thtat mushroom mycelium grows. Lee hasn't been able to test out her flesh-eating suit, "but she did say she has some expired meat in her fridge with which she may test the Infinity Mushrooms."